Yesterday I visited the Chianti area. Chianti is a region in Italy that spans from just below Florence to North of Sienna. The Chianti Mountains border the area on the west and on the west, the valleys of two rivers, the Pesa and the Elsa. 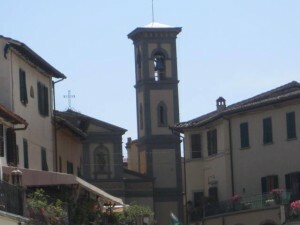 Many people think that Chianti is an actual town, but it is a region with several towns within it. Chianti is famous worldwide for the wines that it produces. It is believed that the Etruscans were the first to cultivate grapevines. This area between Florence and Siena was the location of many disputes and was under lengthy Roman rule. Finally, in the mid-1500’s the eight municipalities of Chianti signed the Pact of Pontignano, which defined rules for protecting and promoting their shared identity. In 1932, the boundaries of Chianti were defined and the production one of Chianti Classico was granted a certificate of primogeniture. This means that it was the “first” or the “original”. For wine to contain the designation of Chianti, it must be produced with at least 80% sangiovese grapes. The most famous route for touring this area is I222, if you are driving, but I took the Sita bus. Today, my destination was Greve in Chianti, a small village in the heart of the region. The route is very scenic with small picturesque villages and vineyards of grapes and olive orchards along the way. The winding narrow roads going through the hillsides made me glad that I wasn’t driving! It took about an hour to get out of the Sita Bus station and into the Piazza Trento. The bus ride cost 3,30 euro for one way, and the buses leave every 30 minutes. The Sita Station is located on the south side of Santa Maria Novella, and you can buy tickets there and obtain information about the routes and schedules. The area is very spread out and although many wineries do tours and tastings, they are not really set up for commercial business. For most of them, it is important to make a reservation before dropping in. There are many organized tours out of Florence which will allow you to visit one or two of the wineries for tours and tastings. I have been on one of these before, but found it expensive and disappointing. So, I decided to tackle Chianti town by town on my own. 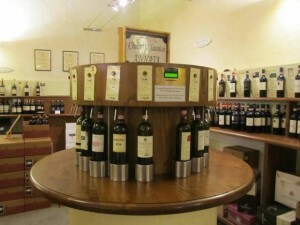 When I arrived at the stop of Piazza Trento, in the center of Greve in Chianti, I took a right and continued along the main road there and came to the Wine Museum. I didn’t go into the museum, but did get information on the main piazza, church and a large cantina for wine tasting! 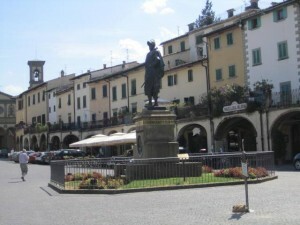 The main piazza is Piazza Matteotti. There are shops for purchasing picnic items and souvenirs and several restaurants. The main church in the village is located at one end, and there is a large statue of Giovanni di Verrazano, an explorer of North America whose ancestral home is in Greve. The highlight of the day was Le Cantine di Greve in Chianti. 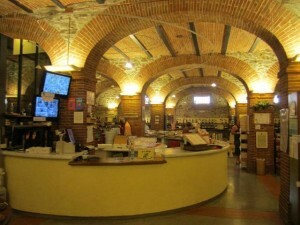 This very large enoteca below surface near the Wine Museum has over 150 wines for tasting. You buy cards for 10, 15 or 20 euro for the tasting. There are stations where you insert the card and select the wine you want to taste. The tasting is automatically dispensed and your card debited for the cost of the taste. The tastings range from .60 to 5 euro depending on the cost of the bottle of wine. Of course you can buy all of these wines here, and they do ship! Other wine accessories and souvenirs are also available. There is a free tasting of olive oils with the purchase of a card. I loved the olive oil with tartufo and the peperoncini! There are also samples of cheese and salamis available for purchase. The cantina is opened for 10 until 7 daily. I highly recommend a visit!